Organizations are starting to make the connection between making information available for consumption and leveraging it to be more agile and productive. Data is more than just an outcome of a business process; it should inform and drive the business. 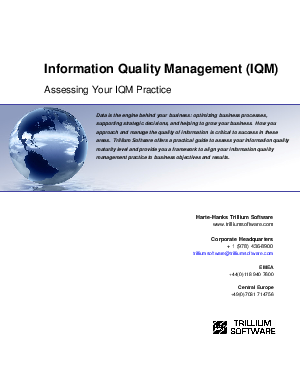 Organizations need to better link business process and performance management to data and information quality. By implementing the six pillars of data quality optimization, your organization can incrementally improve the quality of the data that drives all your operations. When you optimize your information, you optimize your business processes, which results in better decisions and better business.